The San Juan Mountains of Colorado are spectacular any time of day, but particularly so on a clear night with the center of the Milky Way galaxy painting the sky. The tallest mountain is Mt Sneffels at 14,158 feet (4,315 meters), just left of center. 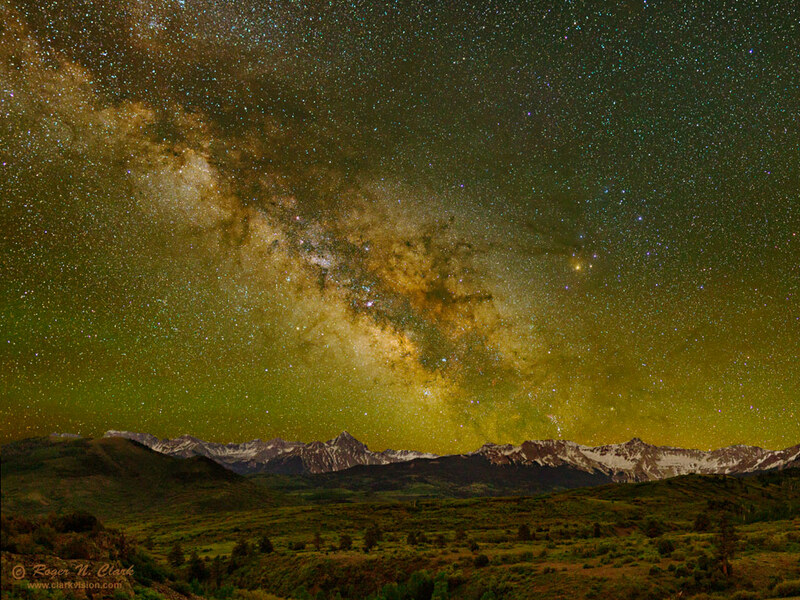 This view at midnight on June 6 shows the bright galactic center above and the the right of Mt Sneffels. The light on the landscape is all natural and from the night sky: light from stars, the galaxy, and airglow. For more on natural color in the night sky see Parts 2a, 2b, 2c and 2d on Color of the Night Sky and proper post processing to show those colors. The bright orange star at center-right is Antares in the constellation Scorpio. The haze around Antares is light scattered by dust near Antares. The sky background appears striped red and green from airglow, molecules in the Earth's atmosphere excited by solar ultraviolet radiation. Green airglow is caused by oxygen atoms. This view was to the south, but in the north while this image was being obtained was a red aurora. Technical. Canon 1D Mark IV 16-megapixel digital camera, 24 mm f/1.4 lens at f/2, ISO 1600, combination of 5 exposures: three tracked 1-minute exposures mosaicked for the sky, and two 2-minute exposures fixed tripod, mosaicked for the landscape, then the sky and land combined. Tracking was by an astrotrac.